Right out of the box, the RinGenie has everything you need to make quick and easy work of holding, layout, engraving, inlaying, stone setting, bright cutting, bead setting, and any other task a jeweler or engraver may encounter. Its rotating spindle is designed to move freely or at set intervals, providing amazing versatility and unparalleled precision. Plus its numerous mounting options make it easy to approach your work at any angle. Watch RinGenie in action, click video tab above. Take your skills to a higher level. No matter what your project demands, the RinGenie is engineered to boost speed and accuracy at every phase of the process. Work faster, work smarter. Be more productive and more creative with the RinGenie. "The RinGenie doesn't replace any human skills it only aids in helping take the ones that a craftsman has to a higher level by its user friendly way of helping to maneuver the piece one is working on." The RinGenie is a money making time saver. 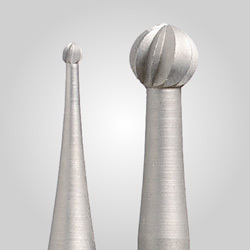 Accuracy in drilling and milling. 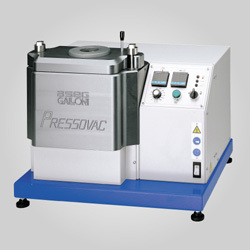 A perfect complement to hand or power engravers. Optional adapter for your Benchmate. Optional Side Helper for engraving/ setting on sides of rings. Complete instructions on DVD and be sure to watch the informative video (see Video tab above). For the price-conscious person looking to get into the workings of the RinGenie, the RinGenie Basic Starter Set is here! The Basic Starter set allows you still to do the everyday setting and engraving bench work less the Drill/Mill Layout Assembly, Drill Guide, Pointer and the Set of 16 Aluminum Collets. 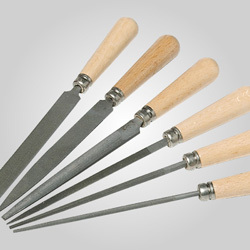 The set of 8 expandable nylon collets will still handle a myriad of jobs in setting and engraving. At the end of the day you are receiving the basic tools necessary in a small concise beginners set. In the future, you can add the other items and build your own deluxe RinGenie Set! Choose your accessories from the drop-down menu below (under "Select to View Prices"). Permits RinGenie to be used with your GRS Benchmate (shown right in GRS Benchmate). Holds rings from the inside for engraving, setting, inlaying etc. on the sides of rings. 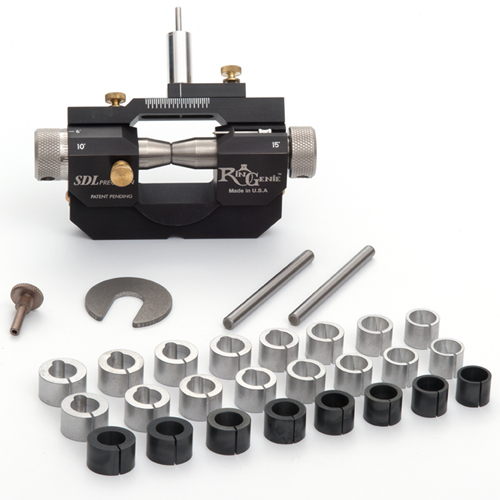 The Angle Adapter kit will add the ability to layout and drill holes at precise angles on the RinGenie. The One Degree Ring kit will allow users to find one degree adjustments within 360 degrees when using the RinGenie. This set of aluminum collet set makes for the perfect add-on to your RinGenie Basic Starter Set. (This 16pc Collet Set comes supplied with the RinGenie Deluxe Set Only). Comes complete in sizes 5, 5-1/2, 6, 6-1/2, 7, 7-1/2, 8, 8-1/2, 9, 9-1/2, 10, 10-1/2, 11, 11-1/2, 12 and 12-1/2. This set of aluminum collets makes for the perfect add-on to your RinGenie Deluxe or RinGenie Basic Starter Sets. This set was designed for the larger ring sizes and comes complete in sizes 13, 13-1/2, 14, 14-1/2 and 15.